My friend and amazing soapmaker Kathryn Hackney shares her experience judging the American Dairy Goat Convention Competition in Boise, ID this past October. She also includes some tips from the judges at the end of the post. Enjoy! -Anne-Marie PS – Longtime readers may remember previous posts (here, here, here and here) about the ADGA convention and judging. I’m still dreaming about their (goat) cheese tables! I flew into Boise and did two full days of judging on Tuesday and Wednesday, and flew out on Thursday morning. However, the convention is HUGE. It goes from October 13th through the 20th. 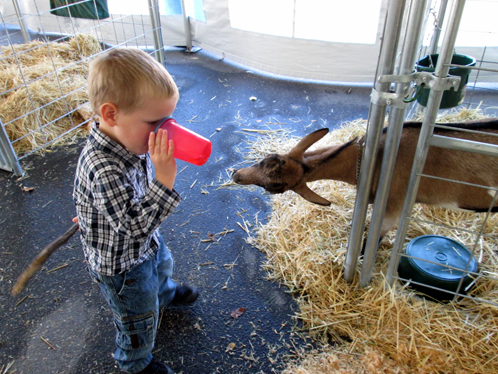 There was even a tent full of goats in the parking lot (had to check it out! ), which were auctioned off inside the hotel on Friday. The people in this association are warm and kind, very much like the participants at soap conventions I’ve attended. Silvia from SV Indulgence Soap was also judging, and we got along so well, laughing about who’s turn it was to lick the soap next for the alkali test. Judging for a body product is like repeatedly performing spa treatments on yourself all day, and obsessively washing and lathering up. There were lots of “ooo’s and aaaah’s” and giggles. All of the products had to contain goat milk, and we tested everything from cold process bar soap, to lotion, to bath fizzies. Our very favorite product of the entire room was a scrub, surprisingly. When you don’t want to stop using it, you know it’s a winner. There was also a new category this year called “Creative”, which featured entries with gorgeous swirls and darling packaging. The “Miscellaneous” category was also fun to test, as we had a dog shampoo bar, poison ivy treatment soap, psoriasis cream, and liquid soap among others. 1) We would love to see more packaging! We are looking for the complete look and ingredients listed is helpful for us to provide feedback. 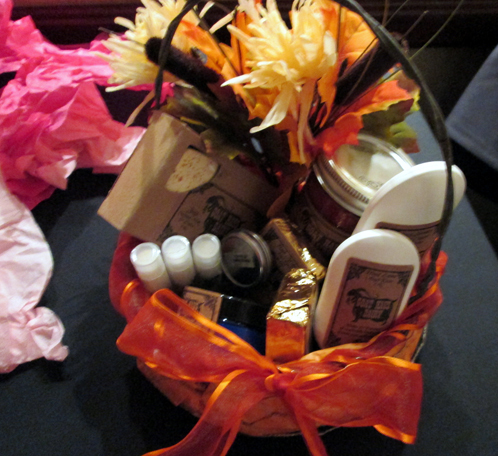 Plus, packaging is important in this event because it sets your product apart from the rest. You can include everything except your personal information. 2) When using goat milk in your product, be very patient when incorporating it and use iced milk as not to scald or burn it. A creamy white product is very impressive! 3) The bars with color caught our eye! 4) Keep the presentation clean. 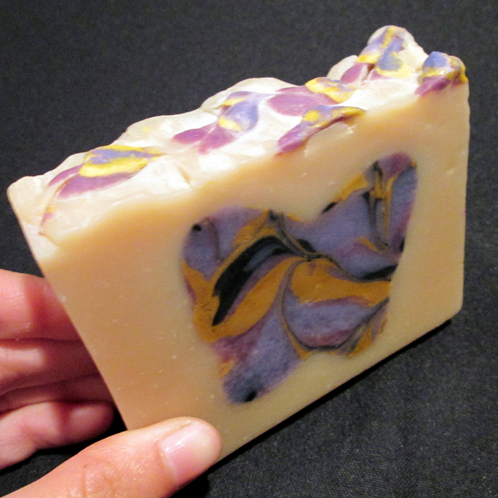 We were really drawn to soap that was cut straight, beveled, and had that little extra effort added. 5) Test it first. We lather up each bar of soap and look for foam stability and big, lasting bubbles. Does it wash off well and leave your hands silky smooth, or is their a little too much oil in your recipe? Make your own little competition in your home and have friends and family test them out. You’ll get ahead by refining your recipe in advance. If you or anyone you know makes goat milk products, let them in on this fun opportunity to strut their stuff.Plus, there are numerous classes on all things goat, including cheese making and healing with aromatherapy if you go to the convention. 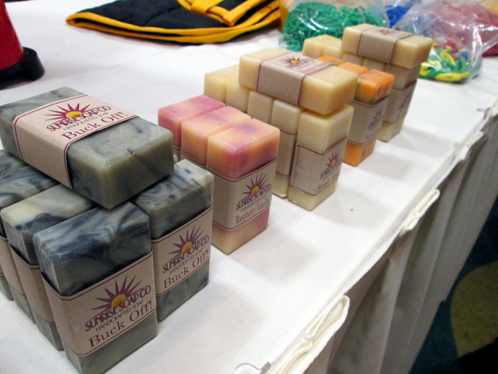 You do not have to be present at the convention to enter your soap so consider this for 2013. Glad you guys had fun! Sounds like a great event. You are soooo sweet Heather! Love ya, hugs!!!!! 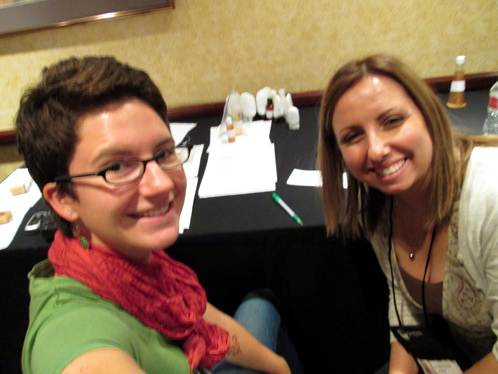 It was so wonderful to hang out with Kat and get to judge the ADGA competition with her. We had so much fun. She is a very talented soap artist. It was fabulous to talk “soap” and bounce ideas and knowledge off of each other. We had so much in common and it was an amazing experience. And I learned so much about goats. This is a fabulous event for goat milk soapers to show off their stuff. Can’t wait to do it again sometime. Likewise Silvia! I couldn’t have asked for a better judging partner. It’s great that we can give this competition more exposure since SO many people are expert milk soapers out there. Hope to participate in this event again. I entered a few bars this year and loved the fact that I got the judging sheets back so I know what I want to improve for next year. It is a great opportunity and I’m already planning ahead to my next submissions. Thank you for all your hard work judging this year!